Angels have been on my mind as of late. We are specifically directed by Paul to not worship them, and I am certainly not suggesting that we do. I want to address the concept we have developed socially for what an angel is. There are several careers that are often compared to angels, and I don't buy that. 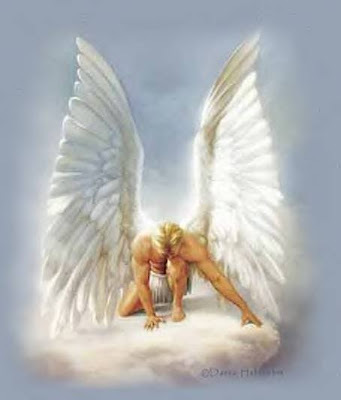 Angels are true beings that serve our Creator. The images for angels are numerous, but most are portrayed with a child like innocence or a feminine softness than I just don't see as Scriptural. I'm not saying angels cannot be feminine, but the image of frilly is simply misleading. As servants of the Most High Elohim, they are not standing around polishing halos. I've had three encounters that I believe were with angelic beings, and on all three occasions none of them were "cupidish" or what we would term cherub faced, or even feminine. I'm going to share each occasion in the next few editions and I would invite our readers to share experiences they have had as well. The occasion I want to share today is simple and I didn't see their faces, but what I did see immediately took me to the 91st Psalm and Matthew 28:3. It was late one evening and I'd been invited to a special service with a friend. I'd ridden with her and she was dropping me off. As I said, it was late and I'd forgotten to leave the front light on, so it was dark. I got out of her car and headed toward the door. In the dark, I misstepped on a loose rock, and immediately began to fall. I literally felt a strong hand and arm around my waist, and one on my shoulder, to steady me. In that moment, I saw what looked like lightning flash next to me. Sound dramatic? You bet it does! It was! Immediately my spirit was filled with the 91st Psalm. My foot was not dashed on the stone, and I didn't fall. YHWH sent His angel to keep me from being hurt. Which of course brought me to another thought later that night. I'm not petite. These angels are no lightweights! All these years later, I saw an image of an angel that made me think of the ones that YHWH's Word promises that He sends, as well as various ones in Scripture may have seen. I mentioned to a friend of mine who does work out and stays in good shape, that I figure more angels have a resemblance closer to him than to the flowery, frilly images we've come to associate with heavenly beings. As the end of days continue to unfold, I'm very thankful to know YHWH is host of a heavenly army, as described throughout Scripture. The term angel appears in Scripture over 250 times.